Mordaunt-Short's Avant 908i might look very similar to the Avant 906i, but the resemblance is largely superficial. The difference is clear when one attempts to lift this senior model from its carton, and discovers that 19kg is a much more serious proposition than the 906i's 12kg. And, predictably enough, the price is heavier too, up from £350 to £500 per pair. Although the attractively slim front view of both models looks very similar, with the same silver coloured aluminium 'skin' sub-baffle covering the top half, and the same twin metal-dish bass/mid drivers and tweeter, closer scrutiny reveals several important differences. 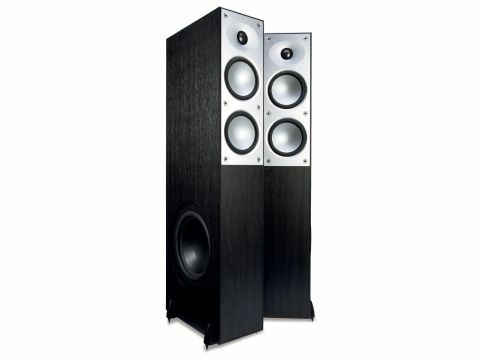 Even though the width remains the same, the enclosure is deeper and taller than its junior brother, and tucked into one of the sides is an extra 255mm bass-only driver. A full three-way design, the enclosure proper is available covered in either black or maple vinyl woodprint, though the main focus of the cosmetics is clearly that silver front section. The twin midrange drivers are actually mounted from behind the front panel, to create a clean look with no visible mounting hardware. An elliptical 'dished' section around the tweeter, redolent of an earlier Mordaunt-Short era, probably contributes to directivity control. An nicely embossed name completes the look. These diaphragms are further refined by the addition of small radial ribs set just in from the edge, which will improve stiffness. The tweeter has a mesh-protected 25mm metal dome. Stylish bi-wire terminal pairs are mounted low down on the back panel, below two separate reflex ports - presumably one loading each of the CPC drivers via a subdivided enclosure. Spike-equipped moulded feet improve the lateral footprint and mechanical stability of the slim enclosure (improved production control has sorted the spike-fixing problem we encountered in the 906i). Not unexpectedly, this speaker is best kept well clear of walls, for fear of generating excessive mid-bass and thickening up the sound - all the more likely since the port is on the rear and the driver is inevitably rather closer to the wall than the front-mounted mid and treble. Although M-S recommends orienting the pair with the bass drivers pointing inwards (which we did for our review), all rooms are different and the outward-facing alternative might well be worth exploring. Compared to the smaller 906i, this heftier three-way has welcome extra authority and headroom, bringing a greater sense of ease and relaxation to the music, especially when turning up the volume. Voices are just a shade restrained, but quite strong sibilants and consonants ensure good intelligibility, while images show fine focus and spread. However, the curse of the three-way is that it's necessarily much more complex than the two-way, especially in its crossover network circuitry, and this presumably explains why the overall sound lacks some overall coherence. Complex textures - including audience applause - are a little confused, the midband sounds a little constrained and somehow fails to deliver genuine 'hear through' transparency, while dynamic tension and expression are both a little underdeveloped. The generous 90dB sensitivity rating corresponds exactly with the manufacturer's claim, and is accompanied by a reasonably easy-to-drive impedance characteristic that stays above five ohms throughout. Similarly, bass extension registers a very healthy -9dB at 20Hz. That all looks very impressive, but it is relatively easy to get good measurements out of a three-way, and the rather more surprising observation is that the 908i doesn't really seem to offer much advantage over the 906i. Yes, the 908i's deep bass is stronger, and its load is less demanding here too, but this senior model's overall balance is arguably less neutral overall, tending to emphasise the broad midband, 200Hz-1kHz, and the important upper crossover transition through the vital presence region is certainly less smooth. On balance it must be said that the 908i's measured performance is competent enough, but no more.